I’m like, that’s kind of creepy, are you a cyborg? Why? Did somebody like, ninjutsu your brain and hypnotize you into thinking something horrible? Why do you need to re-program anything? So what they’re really struggling to do is to master their mind in a more capable way. Let’s talk about how your thoughts are generated. Let’s talk about how your thoughts are generated. Some of this you might already know if you read my book The Charge or you’ve seen my other work in High Performance Academy, where we talk a lot about how you master your psychology. I’m going to give you one simple framework to think through and then some tips, tools and strategies that you can immediately input into your life to better manage your mind. The first thing is, if you’re having negative recurring thoughts and feelings that are coming up, those are ‘easy,’ and here’s what I mean by that. We have two systems of thought, psychologists like to say now. We have the System 1 theory which is your automatic, unconscious immediate thoughts and impulses that come up from your body that usually your brain is saying, “Hey dude, we’ve thought through this before,” or “Hey dude, we’re trying to protect you.” It’s running at a baseline easy energetic level. Part of becoming a more mature, conscious enlightened person is to better take control of our System 2, which is the conscious dashboard on our mind, our ability to more directly work, control, generate, and create our own thoughts and behaviors in the moment, not relying too much on just the things that come up for us. Of course, most of our lives is very System 1 driven, very unconscious, automatic; we’re just going through the emotions. So, I think we have to learn how to do that. One of the simple ways to do that is this framework to understand how thoughts develop into strong and automatic thoughts in our lives. I call the framework ‘RWID’, which stands for relative weight of importance and duration. People who often have negative recurring thoughts and feelings in their life, the reason those keep coming up is because at some point in their life or continually, they are giving those thoughts, the negative ones, more attention than necessarily any other thoughts. In other words, the relative weight that they give those thoughts is quite high. They give a lot of importance to them, so those thoughts are very important to me right now and they’re durational, they last over a period of time. They keep thinking about those thoughts, thinking about those thoughts and it’s all that repetition that seals it in the back of their head and now their head says, “This is an easy thing, I know this one,” and it pulls [the thought] forward. So that simple repetition, because they made it important and they thought about it a lot, keeps coming up for them over and over. There’s a negative and a positive thing about that. The negative is, if you keep obsessing about negative things your mind will be automatically conditioned to bring it up more and more often without your control, automatically. The positive aspect is that we can use that same skillset and same rule to apply positive thoughts into our own life. We can give positive thinking, positive questions, positive approaches to life a lot of importance in our life and a lot of focus. Focus on them and give a lot of duration to them over a period of time and they get sealed in the brain as well, and now the brain says that’s easy, and automatically thinks about [positive things]. So for me personally, I’ve done this so much in my life that I automatically think about the best possible outcomes in almost everything I do. I used to think about the negative outcomes, but I thought that wasn’t supporting me. How did I do that? Leveraging RWID helped. I’ll break it down for you a little bit about how you can do this. The first thing you have to do, in order to improve your mind is to take total control of your attention and notice: where are your thoughts right now? On a continual basis you have to think, where are my thoughts right now? Are they supporting me or are they automatically coming up negative and self-protective in ways that are not advancing my life? Just to be aware, to be conscious of what’s going on in your body, in your sense of feeling and emotion, and a sense of the thoughts you’re actually having. Just start paying attention. Here’s what I want you to do. Just start paying attention to your thoughts any time you’re in line from now on. 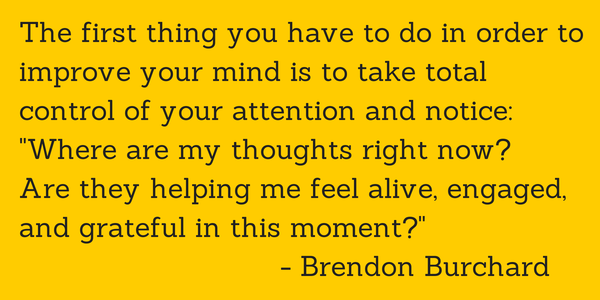 If you’re in line at Starbucks just say, “I’m in line at Starbucks and Brendon said think about my thoughts. What are my thoughts saying right now?” Check in. If you’re in line in traffic waiting for the next car, just sit and think, what are my thoughts right now? Notice what you’ve been thinking about. The more we notice what we’ve been thinking about, the more we can interrupt what we’ve been thinking about. If we just allow that feeling to keep coming up and we don’t pay attention to it, our life can be frazzled and highly anxious. But once we say, “What’s my mind on right now?” and we redirect it, that’s where personal power comes from. First awareness, an understanding and the consciousness to what’s going on, but then the ability now to be self-directed to choose what we want to focus on. So first we’re attentive to it and then redirect it. Visualizing that [positive thing] and assigning a high amount of importance and duration to it. Meaning, making that thing important to us by giving it a sensation – that’s how you make it important. You feel that thing. You sense it. You sense what your next step would be. You sense how it would feel if the outcome would be better. How would it feel emotionally, psychologically, spiritually for that thing? Allow it to have a lot of emotion. Pay attention to it with your eyes closed. You see that thing, you feel it and sense a different step, you know what you’re going to do, you pay attention to it and you keep focusing on that over a period of minutes. Focus-focus-focus, give attention, duration and sensation to [the positive thinking]. Attention, duration, sensation. Attention, duration, sensation. Visualization. It’s repetition of that positive alternative to a negative impulse that comes up that gives us personal power. It’s the attention to that positive alternative over attention to repeating that negative impulse or thought that gives us personal power. It’s not that we’re someday going to wake up in the perfect world in which we don’t have negative thoughts. There are plenty of times I struggle too. I’m thinking about a new dream, a new goal and I’m going to interview some major celebrity or we have a big time celebrity client and I get a little nervous. I can start thinking of all these negative things that could happen if I screw up. My mind immediately interrupts that now and my mind goes, ‘relative weight of importance and duration’. You can either give [a negative thought] more time, energy and focus, or you can just stop it and force your brain – creatively force and direct it – to a different possible alternative. Force it. Literally go, “I’m sensing this negative thing over here is coming up for me. I’m sensing it. Stop! Okay, get to work, Brain! What positive thing could I create and focus on?” Close your eyes and think about it, focus on it, focus on it, and focus on it and build it out. Make it a labyrinth in your own mind so you can visualize and see [the positive thing], feel it and focus on it, focus on it, focus on it. Literally, later in the evening, focus on it again. You start building in that capacity. If this all sounds way too philosophical and you’re like dude, how do I land this? How do I make it happen? Here’s a very simple thing you can do to reprogram your mind. Create a sheet of two very simple things. I want you to write five questions down that you’re going to ask yourself three or four times a day. Five questions that are positive for yourself that you’re going to ask everyday. What can I feel incredibly grateful for right now? How could I surprise or flirt with somebody right now? How could I have fun right now? How could I demonstrate love or excellence right now? Ask these questions in the morning, in the afternoon and in the evening. By asking these positive questions over and over… I mean, if you do this for just 30 days… you’re going to recognize a total shift in your life. They’re just simple questions, but you’re giving them weight by focusing on them three times during the day. You have duration by focusing on them three times a day over 30 days. Your mind starts to re-shift its gears to give automatic ease to answering those questions and living in that mindset vs. an undirected, unconscious mindset. The second thing on the sheet of things you can do… is to come up with three words that describe your ideal self. Mine are ‘present, excited and bold.’ I’m going to focus on those questions three times a day as well. I put them on my iPhone where they come up as an alarm three different times during the day. My phone buzzes and those words are there, where I go, “Oh right, I’m that guy. I have to focus on being that guy vs. whatever. I might be in a bad mood and completely detached. That might sound so simple but people won’t do the discipline. They are so frustrated with their mind because they haven’t done the conscious discipline to re-program it. That’s a last thought here. Yes we all have unconscious thoughts, every single person. If you don’t have a mental disorder then guess what, you have extreme power in your life to overtake it and even those who have mental disorders, psychologists and therapists work with them to re-condition their mind by allowing them a different way of attaching meaning to the past incidents. (But even if they attach a different meaning to the past, the whole focus is bring them into today and teach them to use their mind to direct itself into positive orientations, to make healthier decisions, to enact healthier behaviors. If you can focus on getting more attentive to what you’re feeling and then do these thought exercises… what questions, who do I want to be… and you do that over and over, everything changes. Last thought… our unconscious and our mind is incredibly programmed not just by thought, which is what I’ve been talking about–relative weight of importance and duration– focusing our attention on what questions we would ask ourselves, what positive alternatives can we create for ourselves? What labels can we create for ourselves to support us? But our mind is also incredibly conditioned by action, behavior. You’ve heard the term ‘fake it till you make it.’ I don’t love that, I’d rather just say be authentic over and over again. If you take action on a consistent basis, it teaches your mind to do that. So do things that are positive for yourself. Take bolder actions. Teach yourself, I’m just going to be confident for no other reason. (Watch my video on Being Confident on YouTube). You can actually condition your mind without doing any thought other than just behaving in a more positive manner… and suddenly you find yourself thinking more positively. I know it sounds duplicitous but I want you to really think about that: Your actions condition your mind as much as your recurring thoughts condition your mind. So be a person of good positive thinking. Be a person of good positive action and suddenly, one day you’ll wake up and be like, “I feel amazing, extraordinary, positive.” And that’s what it feels like to live The Charged Life.